The latest Annual Report by Moses Kamya, the Mustard Seed School’s Director, outlines substantial progress during 2017. At last the school’s long-standing water shortage is within sight of relief following the completion of a new high pressure water pipe from a new pumping station on the River Nile. By providing additional unplanned money three-quarters of a kilometer of the underground pipe is being moved out of the way of a new road construction project. It is hoped that the water authority will begin pumping water by the start of the new school year in February. The completion of a new 4-classroom block will also allow the school to halve class sizes by running two parallel classes in each year. 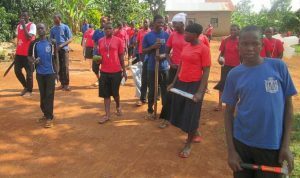 The full report can be downloaded from the blog on the UHST website: http://www.ugandahumanistschoolstrust.org/2017/12/positive-report-from-mustard-seed-school-director/. I have signed UHST up for the Give as you Live program. Once registered individuals can link to thousands of shopping sites, including the likes of Amazon, John Lewis and the supermarkets, and a proportion (0.5 to 1%) of what you spend is paid by the shop to UHST. If a significant number of our supporters sign up it could boost our income by several thousands a year (new people can also donate directly through the system). 1. Go to our website: http://www.ugandahumanistschoolstrust.org/give-as-you-live/ and click the link to register for Give as you Live. 2. Give as you Live send you an email with access to an ipad app or a browser link to enable you to go the the Give as you Live portal to choose where you want to shop. 3. Remembering to get to your chosen shop via the Give as you Live link is the challenge when you have been used to going straight there. But most of the online shops commonly used are available through the Give as you Live link. 4. You will receive regular emails saying how much you have raised for UHST and saying how you can raise more money for us, but you don’t have to read them all. The Humanist Schools in Uganda have faced acute water shortage. Increases in student numbers have put pressure on the limited water resources and the situation has been exacerbated by changes in climatic conditions. Since 1991 the mean annual temperature in Uganda has risen by 1.5°C (see graph). The additional energy in the atmosphere has caused greater variability in weather systems, which has increased the ferocity of rainstorms and given rise to previously unknown periods of drought. Rainfall unpredictability makes it difficult for farmers to time the planting of crops and the onset of unexpected droughts causes almost mature crops to wither on the stem. This has provoked food shortages and further north and east in Uganda there have been periodic famines. 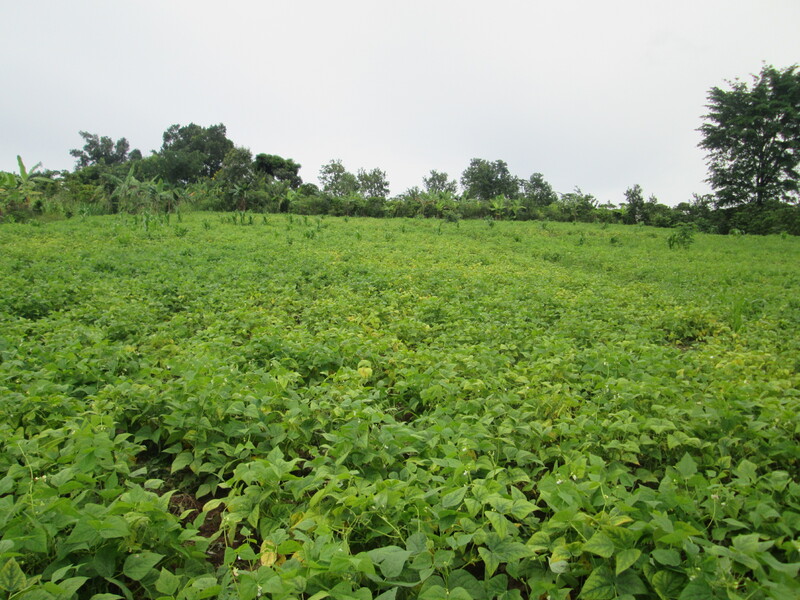 Just over a year ago crops failed around the Mustard Seed School, and some people died of starvation. 1. Poor harvests have meant that parents of children in the schools have had less surplus food to sell to raise money for school fees, so school fee income has fallen. 2. The shortage of food has forced up market prices. This has raised the costs of students’ meals and put pressure on school budgets. In recent years food costs have risen at twice the rate of prices in general. 3. More people have been drawing water from wells, which has led to a progressive lowering of the water table. 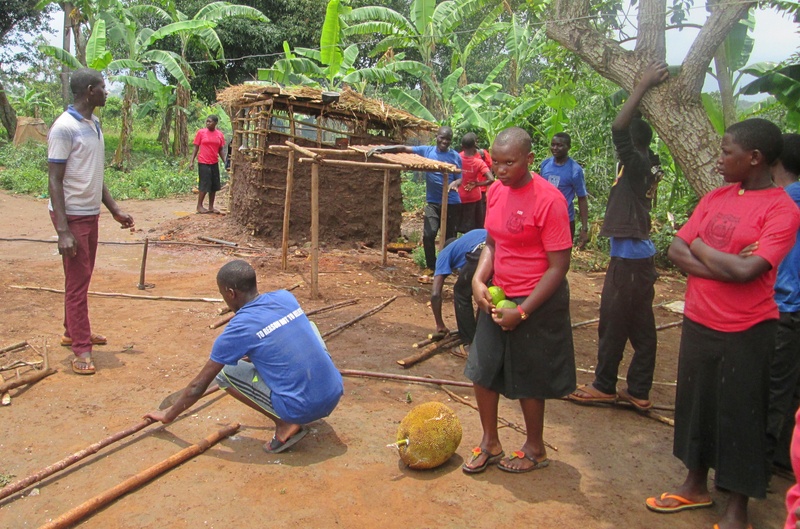 At Mustard Seed School the main borehole, that UHST paid to have drilled in the school compound, has been pumped dry. All of this has come at a time when student numbers in the Humanist Schools has been growing, as parents have been attracted by the higher standards of education and welfare being offered in the schools we support. For the past few years the schools have had no alternative but to turn to UHST for help. We have provided emergency funds to buy food immediately after harvests, when it is available and cheaper. When harvests have failed and local fee income has dropped, we have needed to provide supplementary funds to meet day-to-day running costs. When local parents have been unable to pay the fees for children entering for national examinations, we have stepped in to cover the shortfall. 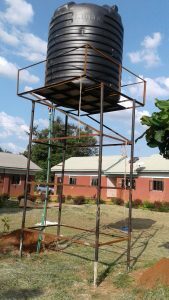 When the first borehole ran dry at Mustard Seed School UHST paid for a new borehole to be sunk near a swamp over half a mile from the school. 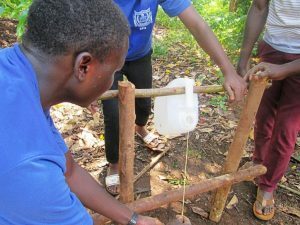 Since then, students have operated a water rota, taking time out of lessons to fetch water needed for washing, drinking, food preparation and cleaning. The Water Company has finished laying pipes and putting the tanks on towers. Taps are in place around the school and we are only waiting for the pumping station to be brought into operation. The children are eager to use tap water in showers and for washing clothes without the hassle of travelling to the borehole. The cooks are eager too since they fetch water continually for kitchen use. It will now be on their doorstep. We are very grateful to UHST for this timely innovation, which will transform day-to-day conditions in the school. 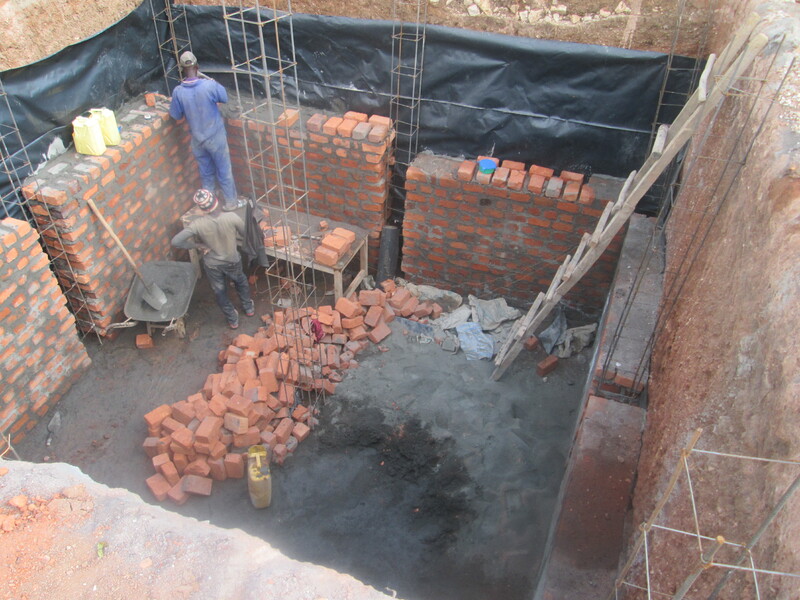 The water project is on-going with the walls ready and waiting for the top slab to be fitted in one week, after a months provision for setting of the columns and walls. 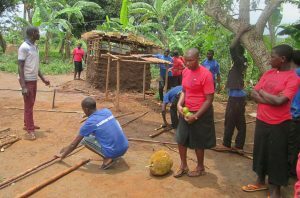 We will have 98,000 litres of harvested water from the three buildings and this will be rain water with minimum contamination to be used for the girls community to wash using less soap – the underground water we use at present has some hardness so it takes some more soap. The girls will have the water in their courtyard and this will help them a great deal. We have had problems with storm runoff but this will reduce since all the water from the roof will be captured. In case of breakdown of the main water supply we shall have water available for preparing the meals. We are very grateful to UHST supporters who have made possible these essential improvements to water provision in the schools, which will have a big effect on student welfare. Unfortunately, neither scheme will alleviate the fundamental impact of long-term climate change on the schools’ host communities. We have just returned from a wonderful few days at Mustard Seed School. Five international visitors joined us and we took part in a variety of hugely enjoyable activities with students and staff. Flowerbeds had sprung up throughout the site since our last visit, which made the site attractive and welcoming. Good results have brought a huge increase in enrolment in the school and this has put pressure on teaching facilities. 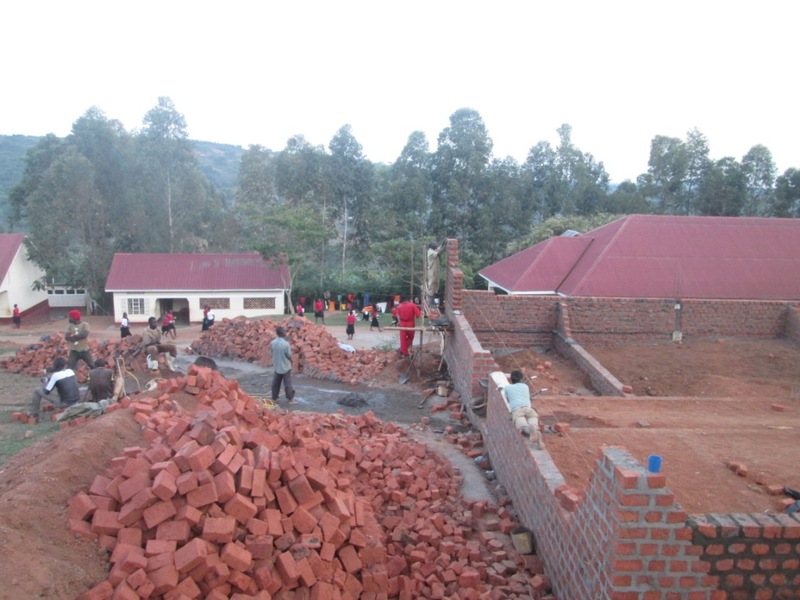 Fortunately, a new block of 4 classrooms, funded by UHST supporters, is nearing completion. This will allow the school to split into two the currently large classes of almost 100 students. This will ease pressure on teachers and create a better learning environment for students. We have just returned from a truly wonderful visit to both Humanist schools in Uganda. Our party consisted of 3 UHST trustees, Steve and Hilary Hurd and Glenda Miller; Renate Bauer, Chair of the German Humanist organisation; and Peter Furness, Chair of Humanist Aid, Australia. 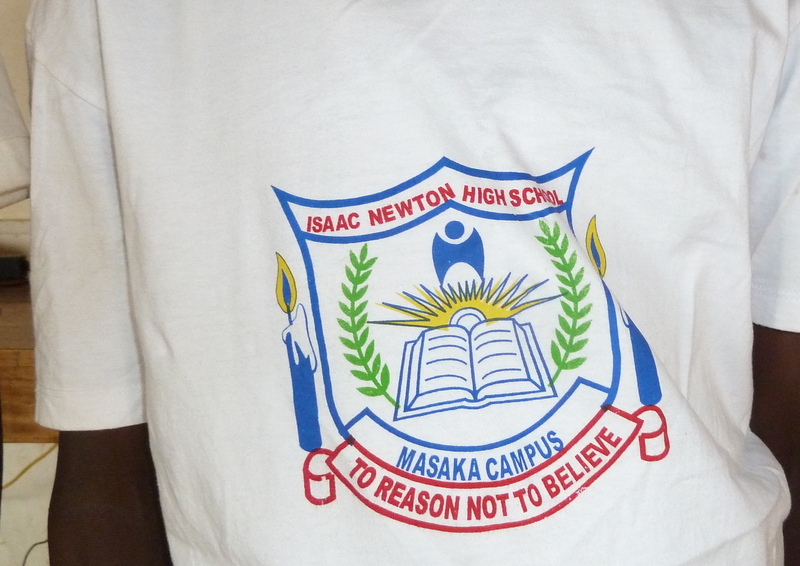 Attached below is my report on our visit to Isaac Newton High School. We feel the school is really motoring. There was a very positive and happy atmosphere among students and staff. The site is looking good and the school is really beginning to develop a distinctly Humanist Ethos. It is under pressure from growing numbers of students, attracted by the school’s improving performance and reputation. Classes are up to 100 in the lower school, which threatens standards. The top priority is to raise an additional £10,000 so we can fund the construction of a second set of 4 classrooms. This will allow the school to run two classes of 50 in each year. Undoubtedly the most satisfying visit we have made to the school, and a testament to the ongoing commitment from supporters to our charity and the schools over the past 9 years. PS I attach a donor form in case you would like to help us raise the money for the new classrooms or provide a much needed additional boarding scholarship to allow an additional child to attend what is becoming a fine school. I also attach a standing order form in case you would like to set up regular payments for a scholarship (£12.50 or £25 a month for a boarding scholarship). We have just returned from a visit to all the schools supported by Uganda Humanist School Trust and were delighted to meet the students that supporters are sponsoring at Mustard Seed Secondary School, Busota and Isaac Newton High School, Masaka. It was a particular pleasure to meet Senior 1 sponsored students for the first time and learn about their family backgrounds. Typical of our new sponsored students are Miriam and Timothy who attend Isaac Newton Secondary School. Miriam is 13 and has three siblings. Miriam’s father died and her mother earns a very small income selling basic goods in a village kiosk, but this is not enough to pay school fees. Miriam got the top grade in her Primary Leaving Exam and aspires to be a surgeon. She likes reading novels and is in the school choir. Timothy is 14 and has 3 siblings. His family are subsistence farmers and have had a particularly difficult time as last year’s drought caused the harvest to fail and they had no other source of cash income. Timothy is the class monitor and likes playing football. On Sundays, he washes his clothes and revises his lessons. He got a very high mark in his Primary Leaving Exam and wants to be a doctor. All the students we support are boarders and the girls are delighted with the new hostel that has just been built at Isaac Newton. Boarding keeps the students in a safe environment and provides them with three meals a day and study facilities in the evening and at weekends. Most come from extremely poor homes with no running water or electricity. 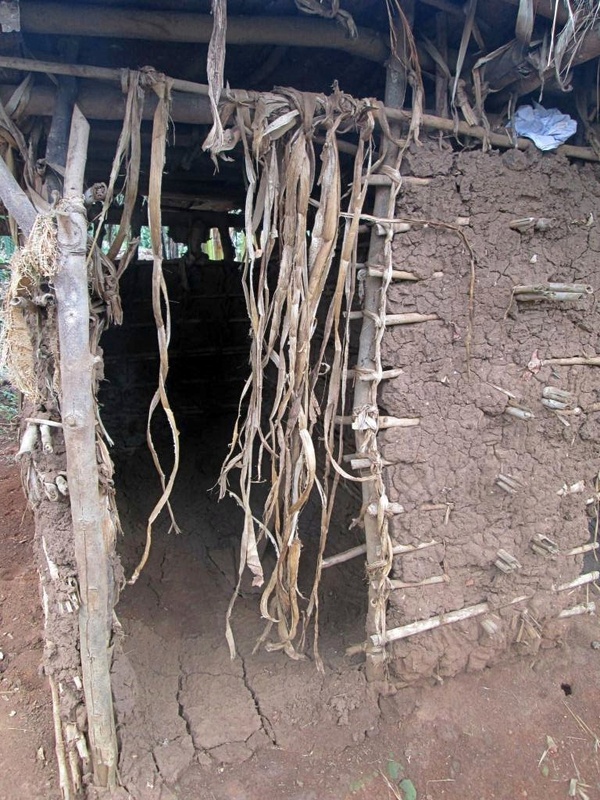 The picture shows the home of one of our students attending Mustard Seed School. Brian and Flavia are typical of the sponsored students at Mustard Seed, which is in a particularly impoverished rural area. Here too the harvest failed last year through lack of rain. All the sponsored students gained a first grade in their Primary Leaving Exam. Brian is an orphan, his parents died in an accident. 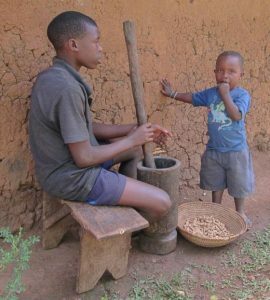 He and his seven siblings are cared for by their grandmother who has a small plot where she grows food for the family. There is no spare money for school fees. Brian is the class captain and is in the football team. He likes science subjects best and would also like to be a doctor. Flavia’s parents are alive and manage to feed their eight children by growing rice and maize and rearing goats. She is the school time keeper and likes to read books. She is in the music, dance and drama group and helps to clean the compound at the weekend. Despite their challenging background all our sponsored students are happy and healthy and are always smiling and laughing. They study extremely hard and have very high aspirations. They all expressed their gratitude to their sponsors for the chance they have been given to have a Secondary Education. We urgently need additional sponsors so that we can offer scholarships to bright, needy students again next year. A full scholarship covers tuition fees, a place in the school hostel, food and school uniform. It costs £300 per year and can be paid in monthly instalments of £25. Some sponsors pay £150 per year, in which case two people provide for one student. Scholarships are allocated at the beginning of the school year, in February. Sponsors are sent a photo and some background details of their student and at the end of each year they are sent their exam results. Ideally sponsors agree to support a student for 4 years and sometimes 6 years if they return to take “A” levels. If you are interested in helping by sponsoring a student, application forms are available at http://www.ugandahumanistschoolstrust.org/donate/scholarships/ or, for more information contact scholarships@uhst.org or call Professor Hilary Hurd on 01782 750338. By sponsoring a student you can totally transform the life chances of an underprivileged child. 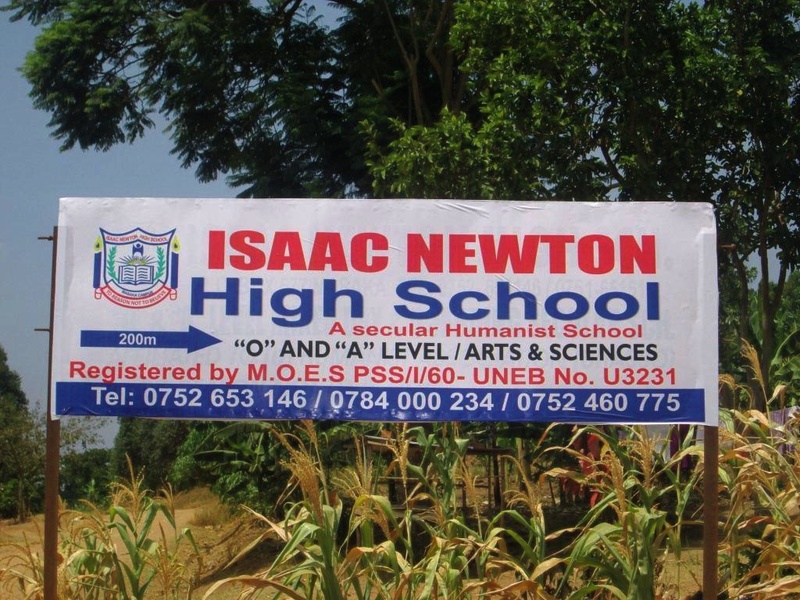 Isaac Newton High School is a product of the local community, which has nurtured the school throughout the first 10 years of its development. The school is now determined to do what it can to help the community it serves. A month or so ago it formed the Isaac Newton Community Development Association to help local farmers to raise their productivity. 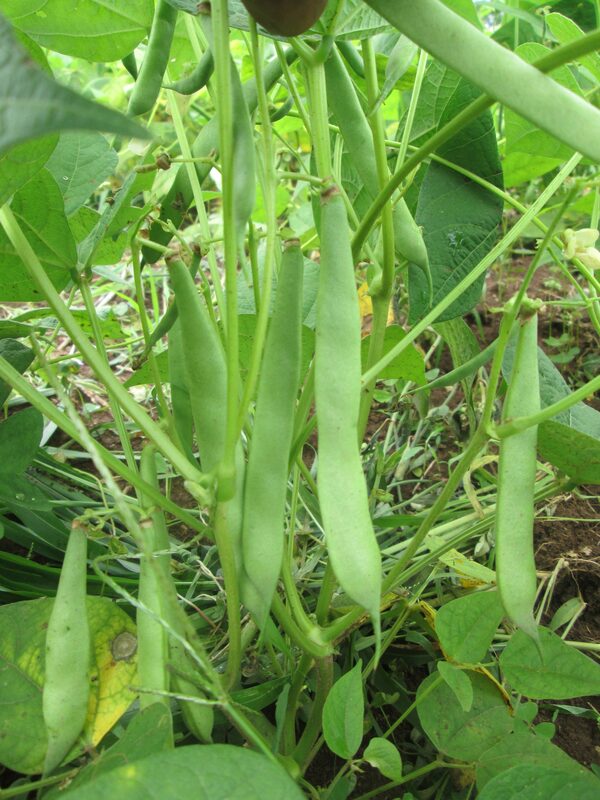 The school has started to buy fertilisers and seeds in bulk and provide them at cost to local farmers. In its latest development, it is adapting the curriculum itself to the needs of the local community. A-level Agriculture students, who work on the school land to grow crops to supplement school meals, are undertaking a very practical piece of research to help local farmers by finding the optimum way to use inorganic fertilisers. Notably, they are trying to find the best levels of use of the most common inorganic fertiliser used in Uganda, DiAmmonium Phosphate (DAP). On harvesting the weight of beans from each area will be noted and the results will be presented to the local community group, who will decide how to adapt their practices in the light of the findings. This Humanist School is leading the way in giving its students a sense of responsibility for the community which has nurtured them. Such activities boost the genuine sense of pride which local families feel in Isaac Newton High School, which they cherish as their own. Since the playing field was completed at the Mustard Seed School, there has been a large increase in opportunities for both boys and girls to play sports. Football is popular and there are both boys’ and girls’ teams. Athletics is also becming a regular feature of co-curricular activities. “Mustard Seed School Busota lays emphasis not just on students’ academic progress but also on co-curricular needs as well. Sports and games are considered an avenue for students physical growth, confidence and provides very good publicity for the school when teams do well in local competitions. 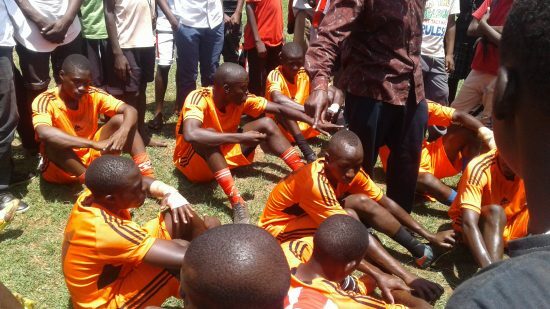 Last year the boys’ football team took the Kamuli District coca-cola post primary trophy. They were one of the two teams chosen to represented Kamuli District in the regional football finals, where they reached the quarter finals. 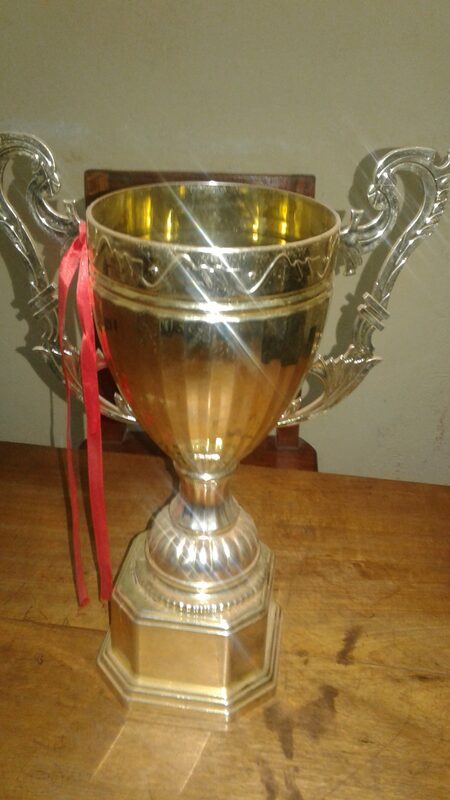 This year the boys football team defended their trophy in the annual coca cola post primary football competitions in kamuli district. They reached the semi finals. Unfortunately, there was unprecedented violence between children of two schools competing in the other semi-final so the final was called off. 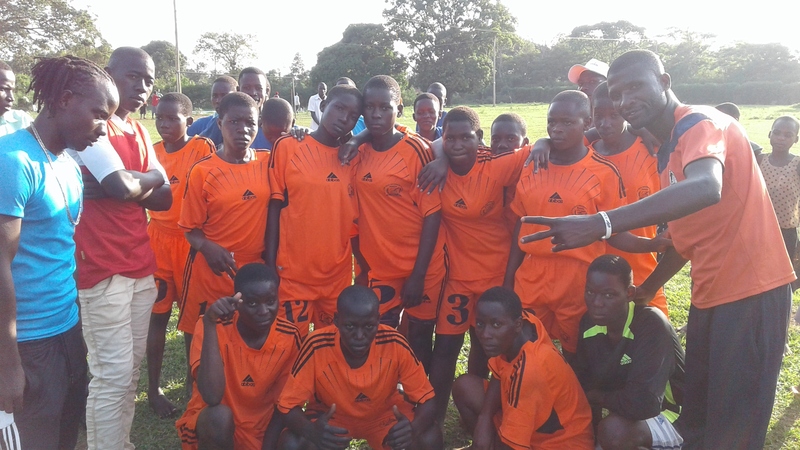 However, we have been chosen with another school to represent Kamuli District in the coming regional tournament on 13th April 2017 at Bukoyo High School in Iganga district. In 2017 there has been a huge increase in the number of parents wishing to enrol their children at Mustard Seed School. Instead of the normal intake of 50 students a year, the school has enrolled twice that number. This follows two years of good O-level results and the first year of outstanding A-level results. As a result we have been helping the school plan for expansion. We have secured minimum 25 year leases on two large blocks of school land, and leases are pending on the rest of the land. This gives us the confidence to raise funds for a major expansion at the school. 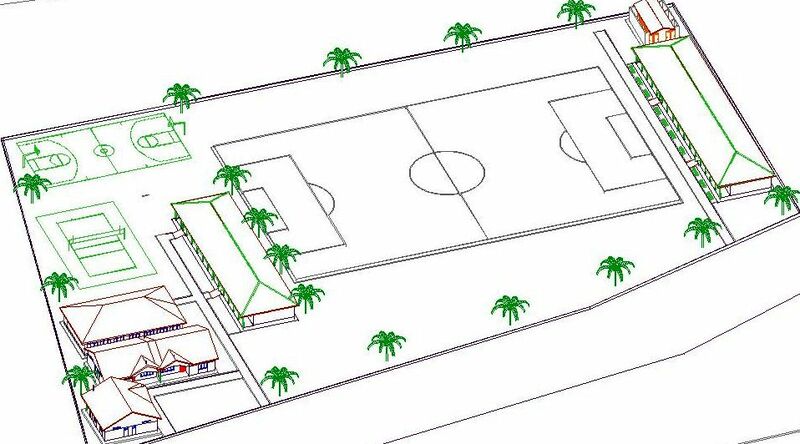 We have funded the services of a local surveyor who has drawn up the plan below for future developments around the new playing field. The aim, over a number of years, is to build a new 4-classroom block, science lab, computer room, a new hall and staff housing. The immediate priority is to provide additional classrooms, so the school can create two first year classes on the path to becoming a two-stream entry school. The first requirement is to build a security fence around the site. UHST has already sent funds to start this work. Immediately the site is secure we will begin the phased funding of the new 4-classroom block (see plan below). UHST will need to raise £27,000 for this and we will need all the help we can get. A new toilet block will also need to be built at the same time. These developments will make a huge difference to the school and set it on the path towards sustainability. Ugandan A-level results were released on 1st March and students at Mustard Seed School are delighted with their achievements. 15 students out of 16 gained the minimum of 2 A-levels which they require to continue their education at vocational college and university levels. This is a major advance for the school and both students and staff deserve congratulations. (Students taking their A-level subsidiary Computer Studies eaxmination). This follows the steady improvement in O-level School Certificate results in recent years, which has encouraged more students to stay on at school for A-level study. Out of 16 students entered for A-levels at the end of 2016, all but one student gained at least two A-levels – the minimum requirement to move on to Higher Education courses. With two A-levels students are eligible for further academic study but also for a variety of vocational courses including: training for nursing and medical ancillary occupations, teaching (especially at primary level), agricultural college and technical training, such as motor vehicle mechanics, plumbers, electricians. 8 students, 4 boys and 4 girls, gained 3 A-levels, which is a huge achievement for a small rural school. This will enable the students to move on to good universities if they can secure funding. Competition for full government scholarships on academic courses is tight and probably none of the students have the grades required for this. Students training as nurses and teachers are usually eligible for state support, but others, who find it a struggle to fund further courses, should be able to find better jobs in the labour market than would have been possible without their qualifications. 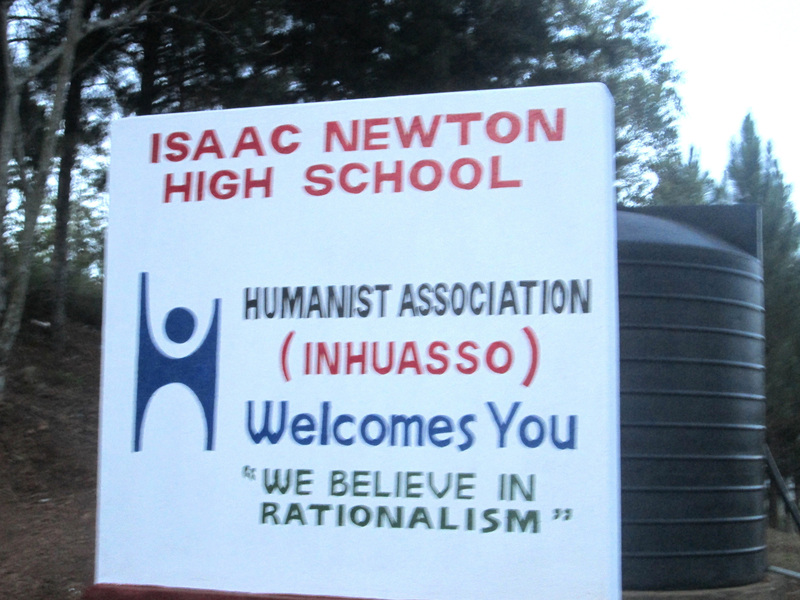 Last weekend members of Isaac Newton High School Humanist Association (INHUASSO) – students and teachers – launched a new Community Service Volunteer Program with a sanitation and hygiene drive in the community near the school. They went to the homes of 8 needy families, 5 of whom have students at Isaac Newton High school on scholarships for bright but needy children. They worked to improve pit latrines which were in very sorry state; many were almost collapsing and others were full to overflowing. 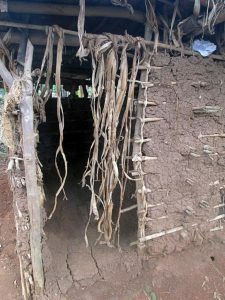 Most of the latrines, which had tree logs as the floor, were rotting and cracking and generally found to be in very sorry and dangerous situation as you can see from some pictures. 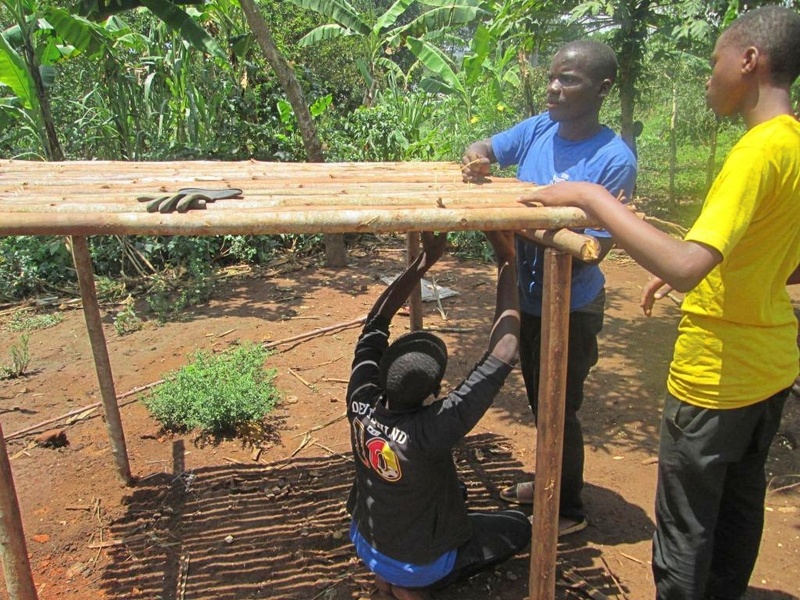 The programme involved constructing new covers on the pit latrines. clearing grass around the houses to deter snakes. The volunteers also visited the local primary school to encourage the children to enrol at Isaac Newton School, when they complete their primary schooling. Some local families were found to comprise very elderly grannies taking care of very young grand children, whose parents had died or gone away for work. The volunteers hope to be able to help families like these and others in future. The volunteering activities will be done on Sundays when the other Christian members of the school attend prayers. 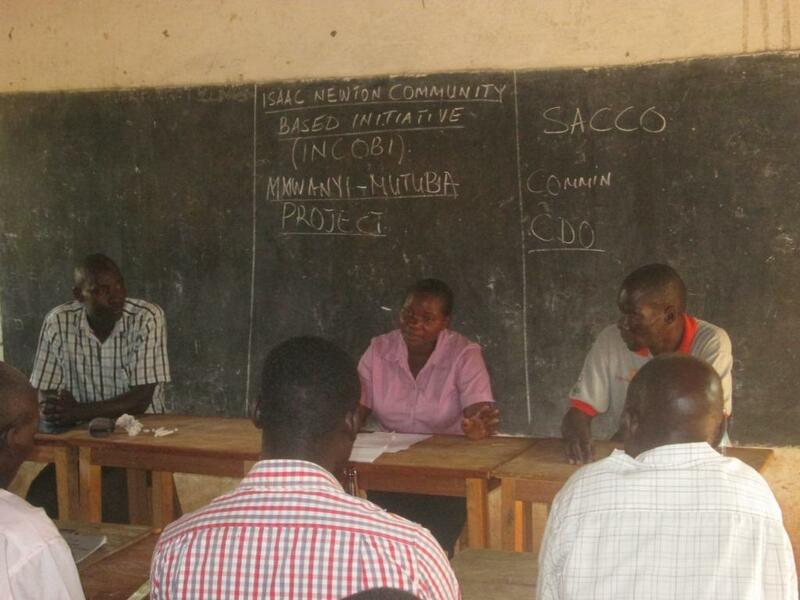 Also, last Sunday, there was a second general meeting of the new Isaac Newton Community Based Organisation. The purpose of this meeting was to share expertise in order to plan for the new planting season. It was agreed to use a room in the reception house near the school gate as a farmers shop, where farm inputs will be bought in bulk from wholesalers and sold to members at cost price. This will reduce substantially the cost of farm inputs, such as fertilisers, seed and stock food, and help to raise productivity on the local farms. Isaac Newton High School in Uganda has been working on projecting the Humanist Ethos of the school to the local community and to visitors. It has a new school sign, which proclaims its Secular Humanist stance. Peter Kisirinya, the Director of Isaac Newton School, explains that, “The active executive committee of our Humanist Students Association is planning voluntary activities around the school community this coming term that will involve improving sanitary conditions, teaching local people about disease prevention especially Malaria and HIV/AIDS and educating them about family planning methods“. The school T-shirts (right) bears the school’s motto “To Reason not to Believe“. Following the very successful Humanist Ethos Project in 2015, all three Humanist Schools have been working to make the schools distinctive from the religious schools around them. They now work to a common set of school rules in which the disciplinary code rejects violence in favour of guidance. Individual responsibility is encouraged and school conduct is based upon the promotion of an empathetic approach towards others. Guidelines have been agreed for the conduct of lessons to encourage students to become independent and autonomous learners, foster mutual respect among teachers and students and to encouraged a child-centred approach to learning. All three schools now expect new teachers to sign a pledge that they subscribe to this common understanding. Each school has appointed a Humanist Counsellor, whose job is to monitor and develop each school’s Humanist Ethos. Humanist Student Associations, which have been set up in each school, encourage students to take part in activities that foster care for individuals and the wider community. Led by Robert Bwambale, the Director of Kasese Humanist Primary School, the schools have designated a set of special days where they celebrate important landmarks contributing to a better world, such as: World Environment Day, World Humanist Day, World Food Day, Darwin Day, World AIDS day, United National Day. At Kasese and Mustard Seed School the initial focus of the students association has been to work together to improve nutrition within the school by embarking on projects to rear chickens in order to increase the amount of protein in the diet of students – they see this as an example of self-help directed towards making things better for the wider student community as well as promoting the knowledge and skills of animal husbandry. UHST very much welcomes these initiatives and we hope to be able to continue to provide some funds each year to help the student Humanist associations to develop into vibrant and attractive elements of school life, which help to draw each school closer to its local community. Uganda Humanist School Trust’s 2016 Annual Report and provisional accounts have just been released. Download a copy of 2016 Report. We are encouraged by the steady progress the Humanist Schools in Uganda are making. UHST and the schools would like to thank all our supporters for their ongoing support, which has sustained the growth of these pioneering Humanist Schools in Uganda. They are really beginning to make a huge contribution to life in the communities of which they are part. Educational standards have been steadily rising and the schools performance in national examinations has been better than many other schools in their Districts. The schools are attracting students from a wider area and, while this moves the schools towards sustainability, it is also pushing up class sizes to unsustainable levels. In 2017 UHST is helping the schools to move to their next phase of development which will shift them from single to double stream entry. Having two classes in each year will make it necessary to double to the number of classrooms and to expand all other facilities, including the provision of books and other learning materials. 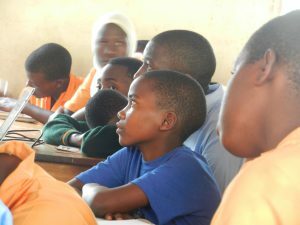 Our current appeal is for funds to construct at Isaac Newton School a multi-media block (with 3 news classrooms, a science lab, teachers’ development room and storerooms all wired for dataprojectors, computers, microphones and speakers to improve learning in large classes). Many supporters have already helped us to build the fund to £16,000.We are applying to another charity for matching funding but we would welcome any help you might be able to give us to attract further funds. If you would like to know more please contact Steve Hurd stevehurd@uhst.org. Workmen are setting up camp at Isaac Newton High School in preparation for the installation of new high-tension power cables. This is part of the Ministry of Energy and Mineral Development’s rural electrification programme. 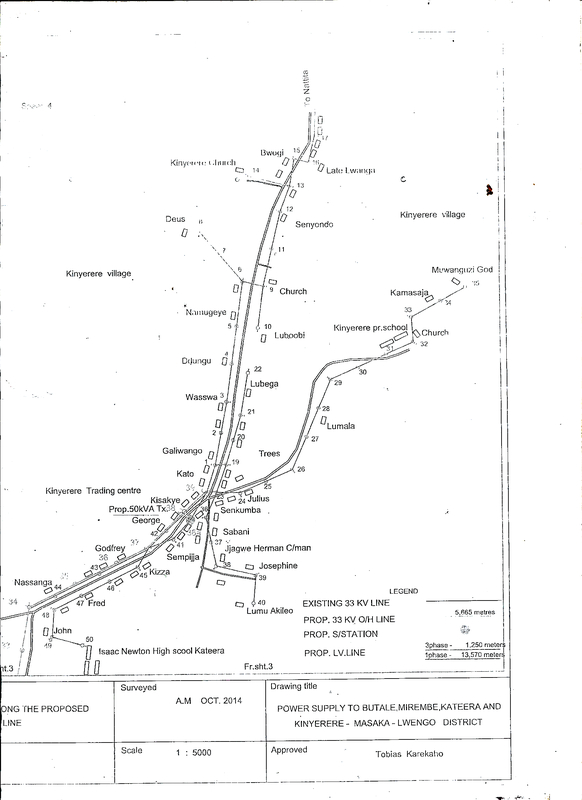 The scheme will bring much needed renewable hydro-electric power to the school and to the villages of Kateera, Kinyerere, Mirembe and Kibisi, where most of the school’s children live. The total cost of the project is £53,000. The Uganda government will cover £42,000 of this, using funds from the World Bank. However, the need for the local community to find 30% of the costs was proving to be a bar to their participation in the scheme. Peter Kisirinya approached UHST for help and, following an appeal, we received generous donations to cover the outstanding £11,000 from UHST supporters in Leicester Secular Society and one working for Google in California. The installation of a reliable power source at the school will provide lighting for over 200 boarding students at night and provide power during the day for computers and audio-visual equipment. The local community will have electricity for lighting at night and to operate radios, TVs, power tools and other appliances and equipment. 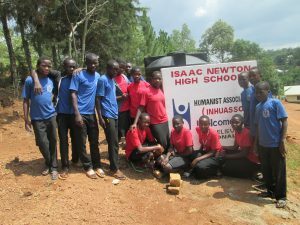 Isaac Newton High School’s prominent role in sourcing the funds has greatly enhanced the school’s standing in the community. Hosting meetings related to the power project has made the school the natural focus for community activities. 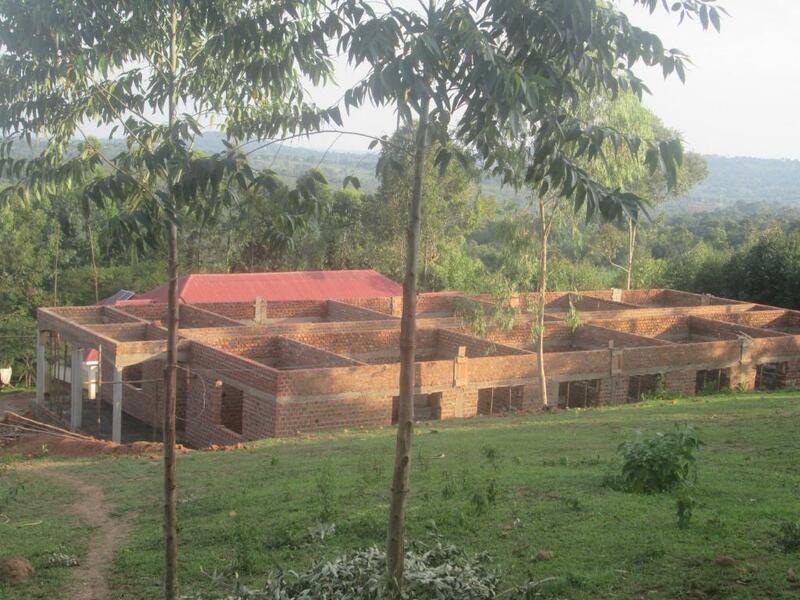 For some years Peter Kisirinya’s vision has been to use the school to enhance the welfare of the wider community. A report we produced in 2013 (http://www.ugandahumanistschoolstrust.org/wp-content/uploads/2013/11/INHS-Economic-Impact-Report-Nov-13.pdf) highlighted the huge contribution the school was already making to the economic regeneration of this impoverished rural area. Peter’s latest initiative is to follow up the Power Project with the establishment of a new Community Based Organisation (CBO) to promote the economic and social development of the area. 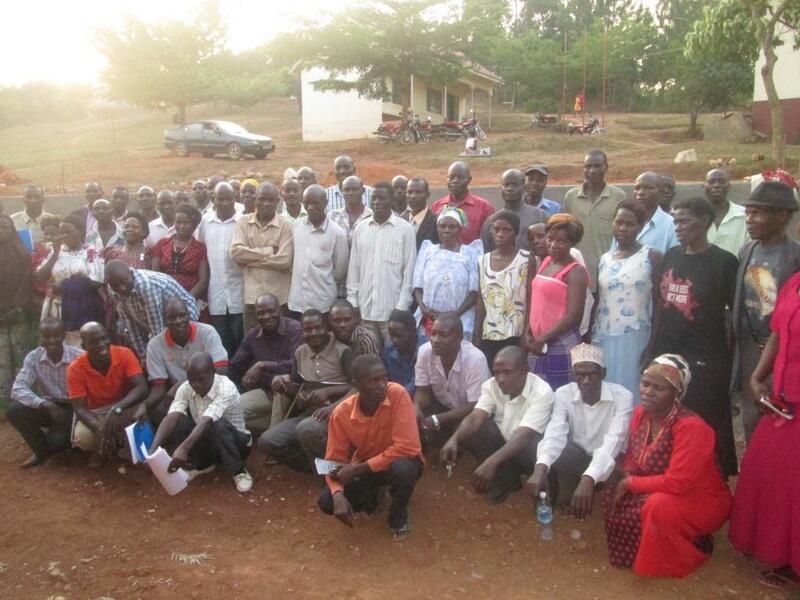 They held their first meeting, attended by 27 members of the community, on Monday 2nd January and a constitution was agreed the following Sunday. They adopted the name “Isaac Newton Community Based Initiatives: Improving Lives Through Sustainable Agricultural Practices” and voted in members of a governing body. To introduce within the community secular ways of living to avoid discrimination based on religion, gender, tribe, political and other divisive tendencies. The CBO, while owing much to the school, will be wholly independent. Its management board will be responsible for accounting and finance and it will have a separate bank account and the power to borrow for projects. The sorts of projects, which the community may consider, include: maize milling, coffee grading and marketing and the purchase of shared storage facilities and agricultural equipment. 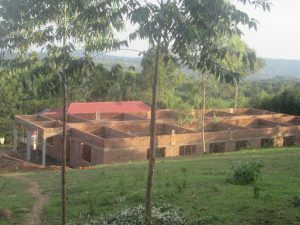 This whole community enterprise has been made possible by the creation of this Humanist School at the heart of the community and the huge esteem and trust which Peter Kisirinya has earned over the past ten years. It is a tremendous testimony to Peter’s dedication and it is wonderful to see his very ambitious early humanist visions coming to fruition. The growth of student numbers at Isaac Newton High School has placed pressure on accommodation. This has been keenly felt in the Girls’ Hostel. Designed for 96 students, with 6 to a room, the hostel has been accommodating over 140 girls, with bunk beds side-by side from wall to wall. This is not only uncomfortable for the girls, it is dangerous. Overcrowding makes exit more difficult in the event of fire and diseases spread more quickly through the student community. Fungal infections of the skin have beome more common as have upper respiratory infections. An obvious answer would be to turn students away from the school. 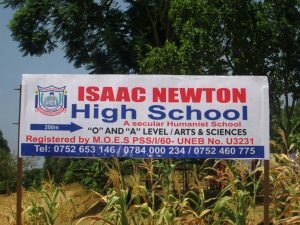 However, Isaac Newton is the only secondary school for many miles and the local community has embraced the school as its own. Families, therefore, demand that the school takes their children and senior staff find it hard to say no to them. Furthermore, there is a strong need for boarding accommodation, particularly for girls. We are finding that boarding students perform better in exams than day students. They escape the chores they would be expected to do if they lived at home, digging, housework, fetching water, food preparation and cooking, so they have more time for school work as well as having access to books, computers, lighting at night and desk space to work. Orphan girls, in particular, are protected from the sexual harrassment which they can sometimes experience in the villages. 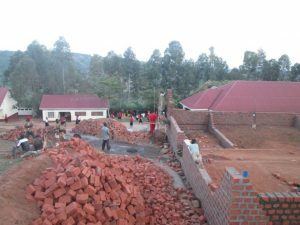 As a first phase of building work to expand the school, St Louis Ethical Society in the USA has valiantly raised the money to build a second girls’ hostel. The new hostel, whose construction is now well advanced, will relieve pressure on the existing hostel and eliminate overcrowding. Whereas the existing hostel has rooms that are open to the roof space, the new hostel will separate each room off by having a ceiling through the building. With each room being a sealed off space, the girls will suffer less noise disturbance from other rooms. It will also be harder for mosquitoes to carry malaria from an infected child to others throughout the hostel and the spread of other air-borne diseases will also be more difficult. Large buildings are costly. The new hostel will cost around £32,000. This covers land clearance and levelling, foundations, construction of walls and roofing, windows and doors, electrical wiring and fittings for lights, plastering and painting plus the construction of an associated toilet block, wash rooms and pipework, drainage and cess pits and preparing pathways and a garden with trees around the building. UHST and the staff and girls of the school are very grateful to members of St Louis Ethical Society who have raised the entire costs of this project. Their efforts have been led by Ed Schmidt, who has visited the school on a number of occasions, and Kate Lovelady, the leader of the Ethical Society. At a recent meeting of the group Kate showed pictures of the Humanist Schools in Uganda and gave an inspiring address about the history of the Ethical Sociaety’s involvement with UHST and the schools. Below are links to the pictures of the schools, an MP3 file of Kate’s speech and a link to the website of the St Louis Ethical Society. An update on exciting new developments in our Uganda Humanist Schools Project, and some of the cosmic questions raised when we contemplate the different circumstances of people around the world. Photos (pdf) to accompany the presentation. UHST and the school are looking forwarding to welcoming a representative from St Louis Ethical Society to open and name the new girls’ hostel during the next International Friendship Visit to the Humanist Schools in Uganda in early July 2017. Plans for a new Multimedia Block: Isaac Newton School is growing rapidly. School numbers are approaching 450 and the school has been struggling with a first year class of over 100 students. 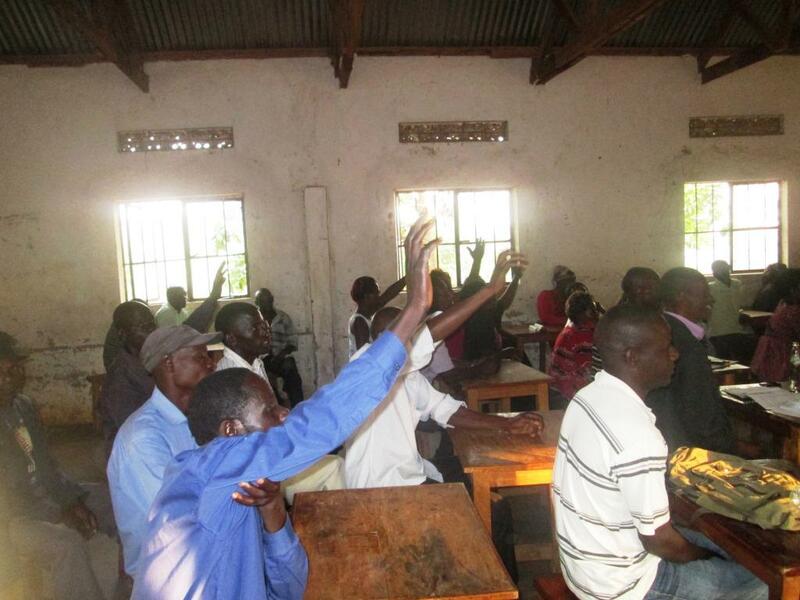 It is clear that to keep classes down to a reasonable (by Ugandan standards) class size of around 50, the school needs to add a second stream. 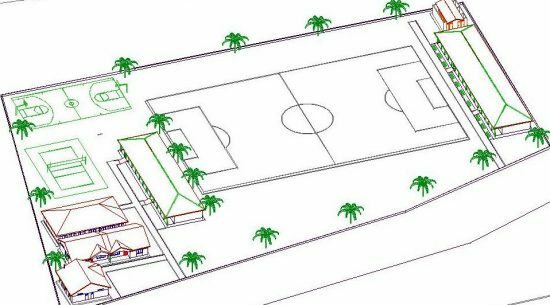 In order to do this, the school must have additional classrooms and our intention is to help the school to improve the standard of teaching and learning through better building design. Working with a local architect, the school has come up with a plan for a large new building that has 3 classrooms, an additional fully-equipped science lab with adjoining prep room, and a room where teachers can prepare material and undertake professional development, with a side room with a high-speed, low-cost RISO printer and secure storage for laptops and other equipment. Senior 1 students trying to listen to their teacher, but with no pictures to aid their learning. Uganda has an equatorial climate and is prone to heavy storms every 2 or 3 days. With existing classrooms, which have corrugated iron roofs, the noise of the rain is so loud that teaching has to stop during heavy rain. Also with larger classes students often find it difficult to hear what the teacher is saying or to see what is written on the chalk board. In order to overcome these problems the new building has been designed with a sound-insulated ceiling, microphones and speakers to improve audibility and ceiling-hung data projectors so that high quality images can be projected onto a screen and teachers can take advantage of materials (including pictures, animations and videos) drawn from the internet. This mean that the teachers will be given access to the internet in the teacher development room and the whole building will have security doors and windows. Once it is built, UHST will organise with the school a professional development programme to train all teachers in the use of the new technology and to show them how to embed audio-visual resources from the web into their lesson presentations. It will make possible a major shift in teaching away from the use of dictated notes. The training programme will be extended to teachers in the other Humanist Schools in Uganda who are members of Uganda Humanist Schools Association. It will also complement other programmes in the schools to improve private study facilities for students. As Humanist schools, we feel that it is important to foster independent learning, where students are less reliant on being told things by teachers, and are empowered to learn using independent, authoritative sources of information. We have been flooding the Humanist schools with text books; we have also introduced a wide range of literature and a Reading for Pleasure Programme, the schools have a computer network with a wealth of off-line resources taken from the internet including: the huge RACHEL repository of non-fiction information taken from Wikipedia, the Khan Academy videos for mathematics and science, a large set of e-books, including classic literature, drawn from the Guttenberg collection and large numbers of videos, including Zefirelli’s “Romeo and Juliet”. Click here to see the full plans. The total cost of the Multimedia Block and Large-Group Teaching Project at Isaac Newton School will be £42,268. We are applying to other charities for £25,000 of matching funding, but this will leave £17,268 to be raised from this appeal. 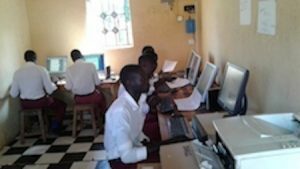 By bank transfer to: Uganda Humanist Schools Truspt, Lloyds Bank, Sort Code 30-95-91, Account 00455909 (please email to let us know so we can track the payment and send you a confirmation of receipt). 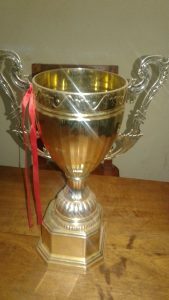 By internet transfer via PayPal using the link: http://www.ugandahumanistschoolstrust.org/donate/make-a-donation/. 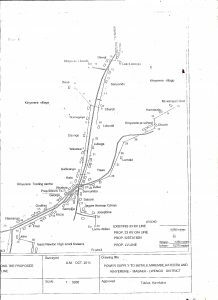 Or by cheque sent to: UHST, 31 Greenmeadows Road, Madeley, Crewe, CW3 9EY. If you are a UK taxpayer and would like us to clain Gift Aid, which boosts your donation by 25%, then please make sure you include your postal address and say that you are happy for us to claim Gift Aid. If the appeal is successful it will enable a huge leap forward in the standard of education at Isaac Newton High School.